A lively strathspey from the singing of Karen Matheson. The latter half of the piece uses the slap base technique, but if this is too difficult the first half can be played on its own. Duncan Johnston wrote this beautiful song for his wife during World War One. 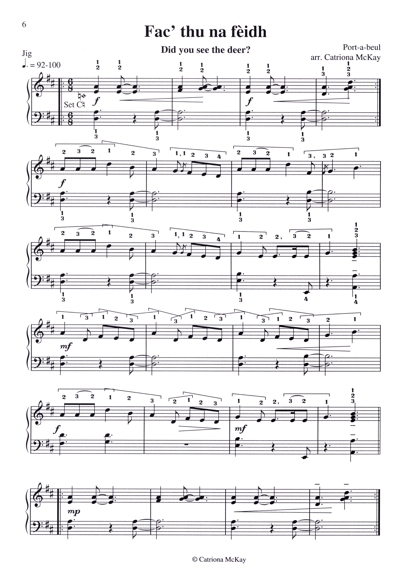 This tune appeared in early pipe collections, but is a well known port-a-beul. Inspired by the wonderful playing of Duncan Chisholm on his CD The Door of Saints. A reel with a bit of oomph! A beautiful slow air from the Simon Fraser Collection.